Problem number two – gray cards require delicate handling (no bending, no fingerprints, no dirt, no scratches, some can’t withstand moisture, etc.). What if you dropped your gray card into dirt in the middle of nowhere? For a demonstration of its use and effectiveness we’ve chosen a scene that will become (after a re-arrangement) a postcard for a friend – autumnal colors, fairy dolls, and our favorite brick wall. Consider 5 shots of the same scene taken under 5 very different color temperatures, ranging from warm incandescent, to very cool high in the mountains. The left part of each picture is the RAW, opened in FastRawViewer with the white balance set to “As Shot.” The right part is the same RAW, with a custom white balance established by clicking on our improvised white balance reference. The mouse cursor shows where exactly the white balance was taken from. 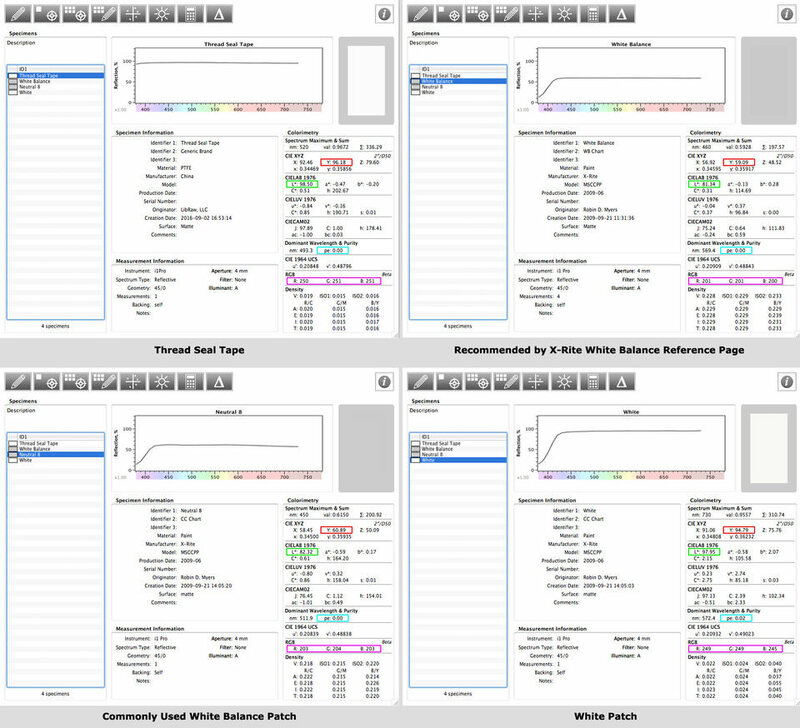 As you can see, our Teflon tape has a reflectivity factor of Y=96.18%, that is the highest of all materials checked, L* = 98.5, a spectral purity equal to 0, and RGB values almost identical to one another (250, 251, 251). As you can see on the graph below, the spectral response of our DIY target is extremely flat. I own a gray card and have never had satisfactory results in the field. It’s technique rather than technical. With the camera on a tripod I try to hold the card in front with my arm outstreched. My arm shakes and I bump the camera. I can’t stand in front as I frequently hold it out of the picture altogether. And it is very hard to hold the dang thing perfectly parallel to the film plane. Can your eraser method solve this? Or is there a technique I am missing? The camera’s automatic white balance typically misses the right WB by a very large amount, even under perfectly ordinary conditions. Then I spend much time hand-compensating in ACR, by eye. If you are shooting raw, you can just set the target somewhere in the frame, and use click-on-neutral white balance tool in a raw converter to establish white balance. Well, that’s the problem. There is never, ever, any place within the picture where I can set anything. Scenics are generally shot at f5.6 – f11, and you can’t do that and have anything much like a foreground. I place a target, zoom in (or get closer), shoot it, and then compose the scene. Forget about the fact that I don’t know the optical characteristics of DGK product but why would I want to spend $16 + tax + shipping when I can get a roll of the tape for 0.79 and build as many units as I want. Please try with the tape, and if it does not work for you, can you upload a raw file with the tape included in the frame? Based on your last sentence either your gray card is no good, or you are doing something wrong. Black works better than gray mostly when the reference target is not positioned correctly, that is it is lit not by the direct light shining onto the scene. Perfect! Small, portable and costs next to nothing. McGiver lives. If this works (and it looks like it does!) it will be simply amazing. If I understand correctly though, the Teflon tape does all the work. Why was an eraser of a particular colour suggested? Would another item create any issues???? Coloured substartes may need more turns of the tape, but most importantly they can cast colour reflexes onto the tape. Wouldn’t black eraser be even better then? As it would not reflect any light and with that introduce possible color casts. Obvious cons, though, would be that you would need more turns of the tape. Thank you very much for this hack, I will try it for sure. Great to have to get the technical explanation too. I have sucsessluly used a white styrofoam coffee cup for the same purpose. The cheapo cups are usually on hand somewhere and they bring the color in nicely. Yes, styrofoam has a rather flat reflection spectrum, with minor bumps that can cause confusion under light sources with spiky spectrum; but it is a rather transparent (to the point you can use it instead of ExpoDisc; or, if hot-pressed, as a dome to put on a lens to use a camera as an incident light meter), can be easily gone with the wind if empty (and if not, transparency can become an issue), and takes more space in a bag. But when you can use it, it does work pretty well. I like that. I’ll experiment. After all, it doesn’t have to be perfect to be better. Thanks for a nice, informative article! More than the motivation for building one such ‘card’, I enjoyed knowing about the spectral reflectance data for the various materials/items. I’ll give it a shot in the field one of these days. If we could heat up teflon w/o melting it we’d have a nice black body spectral curve! ;-) . Maybe we’d already have that at room temperatures in the infrared but I don’t know about the absorptivity of teflon around 10 microns or so. Back to photography, one question: I’d suspect the teflon surface would still work if your contraption is not normal to camera but at an angle (say, 45deg), but only the reflectance might be lower. Is that correct? Yes, you can place it at an angle (and it is placed at an angle on the shots here). As to reflected light, it depends on the angle to the main source of light and to the camera, but generally, with the diffused nature of reflections from sintered PTFE, it remains pretty high within the reasonable range of angles. Seriously, I always look forward to Iliah’s insights on this and other forums. @Iliah Borg something is not making sense to me. I am not quite familiar with the x-rite target, but why is it that clicking on different grey patches produces different white balance results? Are not all the patches neutral? Which one is the “correct” one? Also, I have seen in photos that the passport has another card with patches, specifically for setting the white balance, in different warmth tones. Perhaps, that card should be used instead of this one? Neutrality is different, as it is plotted in the article. In this classic CC24 layout, the recommended one for white balance is N8, the one to the right from the green. It is a rather solid reference, based on 40 years it exists. When you say “different”, by how much is it different? If it is less than 10..20 mired, it is not a real difference. The layout with different gray patches include two practically neutral patches, Landscape Neutral, and Light Clipping 2, both with about 60% reflection. The separate gray page of Passport has the same properties. If you say that N8 is the “correct” one (patch 02 in my list), then indeed it is almost identical to the teflon tape and really close to the rest to make any visual difference. The problem was with the extremes, which had 100 units difference that was obvious on screen. Do you think that a Delta of 50 in the Temp is unusual? It is 10 mired between 3050K and 3150K (en.wikipedia.org/wiki/Mired or www.leefilters.com/light…lator.html ), while the smallest step in light filtering even in cinema-making is larger, 15 mired. 50K difference at this temperature range is only 5 mired, negligible, except when shooting for cataloguing art and artifacts, and such. In a real scene there is normally no chance that 2 references being put in different parts of the scene will show such small variation of white balance. That is one of the reasons why I use teflon, I can make the reference small, place multiple references, and equalize white balance across the scene using masks if the customer demands so. More, if you use an eyedropper in Nikon Capture NX2 in “single point” mode, selecting the 5×5 sample size, you will see the same variation equivalent to ±50K clicking on different areas of the same N8 patch. @Iliah Borg you really do not know how much I appreciate your effort to clarify all this info for me. Apparently, I have still a lot to learn regarding white balance. So apparently, the targets work as designed and so does your magic teflon tape. I am off to the hardware store, first thing in the morning!!! Thank you for all the info. I hope you will create more posts regarding the matter or even showcase you multiple references workflow. I know that I would be thrilled to read them! I understand that this piece of rubber+teflon can be placed within the frame as reference to be used as a WB picker while shooting in RAW. The method could be used as long as your subject is limited in distance or indoor photography etc. How do i employ this method while shooting outdoors, where the subject is far, shooting landscapes or shooting birds or wildlife. White balance is recorded for the light, not for a particular scene. If you can ensure that the target is lit by the same light as the final scene is, you can take a shot of the target, and while converting raw files simply copy the white balance from that shot to actual scene shots. Alternatively, you can put a styrofoam cup onto the lens, point it to the light source, and set white balance that way. You can use ExpoDisc instead of a styrofoam cup if you wish, accuracy will be somewhat better. So here’s another idea I’ve been toying with. What about using lego blocks as a colour passport of sorts. Lego makes sure their colours are precicely controlled and one should be able to pick them up anywhere in the world for much less than an x-rite passport. Would also be easy to create a database of shots from many camera’s, lenses etc from all over the world as a result. First of all, profiling targets are not just about different colours, they are also about a variety of pigments used, each with its own spectrum, to increase the diversity in the target. Second, the target should pose no metameric issues. Third, having glossy surfaces complicates accurate shooting to a point of impossibility. One can try using dulling spray or polarizing filter here, but those vary in their spectra. If one has a spectrophotometer ($300 DIY project currently), the pigments for the target can be sourced from a home improvement store. Those also have tightly controlled spectra, by the way. Once again a great idea of you. Over 1 year I tested to find out, how to become an easy way for “correct” white-balance. I have color-checker passport, Spyder checkr24, gray cards and from lastolite xpobalance and ezybalance 12%! Hm, all of them not works really correct. Today, I tested your advie with the PTFE-seal-tape for sanitary. And, it works great!! And it works also for WB-setting! I use the tape-roll directly in the image and with the click-cape it is always protected! And after a short time, I will remove some inches of the tape and cut it away! So, it is always clean!! Great. Another advantage that the roll is curved. So you can easier find the WB-point with the eye-dropper (ACR) 50% indication or have a look at the histogram (for other Raw-converter) , till the pick-point is about in the half of the histogramm (127). I find out, that the reflection ot the PTFE-tape is very high. If your digicam has Zebra, you can see, that first the PTFE-Tape beginns to blink, when the hightlight is blown away. But, it doesn’t matter, because the tape on the roll is curved and one part will not be overcast. Mind, however, that if the roll is on a coloured bobbin, it may cast colour onto the tape. Sorry, I haven’t forgotten to mention, that the bobbin has to be white or black. Mines is white. Thanks for reply. 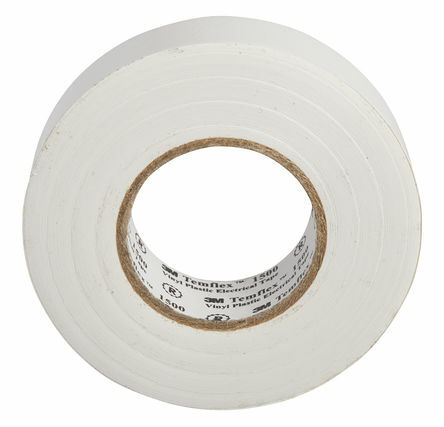 is the white tape you mentioned like this one? It’s a tape used to insulate electric wires, I just have at home .. This is a different one, made from Vinyl. But you can try it too, of course. 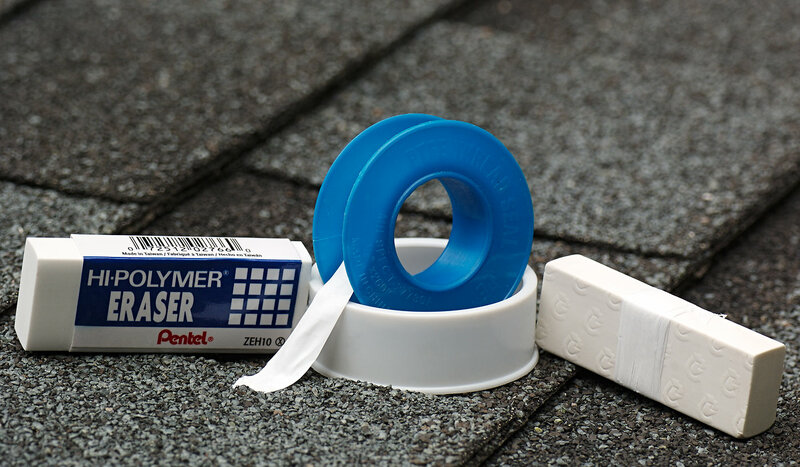 I will find some old credit cards, clean up the surfaces and generously wrap them with plumber’s teflon tape, much like how gaffer tapes are “rolled” onto the cards. Be careful, because the reflexion of the Teflon(PTFE) is very high!! The eyedropper from Lightroom/ACR (Lr) cannot catch the WB, if the point is overexposed! To avoid this, it is better to place the role on the scene. So, you have a curved surface and you can find the best point with the eyedropper from Lr. The tip with the creditcard is great. I suggest to use this for manual-WB with the digicam!! I tested it with daylight, ambientlight and with LED-light. And it works great. Great color accuracy, indeed. What I want to test is SKIN. Skin-tone is very difficult to have it correct. But, I think it will works with the PTFE. Have someone test-result with skin? Have tried stretch-wrapping the teflon tape, but it is not that easy to achieve wrinkle-free surfaces due to the extreme thinness of the tape. So will clicking the eyedropper on the uneven/overlapped/wrinkled parts cause any inaccuracies? Also, given the ideal texture of the teflon tape, can we cut out those white iphone package boxes and still achieve the same WB accuracy as teflon (since the surfaces of the package box is very smooth and matte white)? Getting harder to find real teflon tape. But the white plastic imitation stuff probably works just as well. This article is super cool! Thanks you very much! Do you see any potential advantage to extend “small eraser version” to bigger version – to use it for in camera manual WB (Im thinking about little frame )?